OSCAR night's CharityFolks.com auction for 'Love Cures Cancer' to feature a dozen valentine-pink velvet 'Escape' sleep masks donated by Dream Essentials and a pair of Classic White slimming jeans given by Wizard Jeans autographed by over 50 celebrities at Hollywood's Café Boheme February 8th benefiting the LA Children's Hospital. 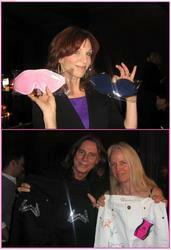 Today, brand managers Mackeonis & Associates were pleased to announce the upcoming OSCAR night auction of a dozen valentine-pink velvet 'Escape' sleep masks, donated by Dream Essentials, and a pair of Classic White straight-leg 'nip & tuck' jeans, by Wizard Jeans, autographed with over 50 celebrity signatures for the charity, Love Cures Cancer, at Hollywood's Café Boheme, on February 8th, to benefit the Los Angeles Children's Hospital. The auction will begin on OSCAR Night (February 27th), at CharityFolks.com and run for 14 days. The contributing celebrities include: Marilu Henner, Mischa Barton, Sofia Milos, Gramma Funk, Kevin Eubanks, Scott Baio, Vivica A. Fox, cast members of 'Glee,' 'Heroes,' 'The Office,' 'Eclipse, 'Jericho,' 'Sparticus,' 'Kings Speech' costumer and 2011 OSCAR nominee, Jenny Beavan, and the producer of 'the Social Network,' Dana Brunetti. Autographs on the pink Dream Essentials' sleep masks include: Mischa Barton, Alicia Coppola (Jericho), Bronson Pelletier (Eclipse), James Kyson-Lee (Heroes), Josh Sussman (Glee), Marisa Ramirez (Sparticus), Oscar Nunez (The Office), Vivica Fox (Kill Bill), Scott Baio, Jenny Beavan (Costumer, The King's Speech"), Nicholas Guest and Fairuza Balk. Autographs on the Wizard Jeans include: Marilu Henner, Charlene Amoia (glee), Josh Sussman (Glee), Ariel Winter (Modern Family), Kiowa Gordon (Eclipse), Christopher McDonald (Harry's Law), Bronson Pelletier (Eclipse), James Kyson-Lee (Heroes), Oscar Nunez (The Office), Kevin Rahm (Desperate Housewives), Katarzyna Wolejnio (The Mechanic), Kevin Eubanks (Tonight Show Band), Sofia Milos (CSI Miami), Edyta Sliwinska (Dancing with Stars), Mischa Barton, Alicia Coppola (Jericho), Rodney Van Johnson (Passions), Caroline Carver (the Royal Today), Josh Rosenthal (The Last Godfather), Vivica A. Fox (Kill Bill), Marisa Ramirez (Sparticus), Leyla Milani (Deal or No Deal), Scott Baio, Billy Zane (Titanic), Tamara Henry (greentwithtamara.tv), Dee Wallace (E.T., the Extraterrestrial), Dana Brunetti (Producer, The Social Network), George Blodwell (Editor-at-large, GenLux Magazine), and Jenny Beavan (Costumer, 'The King's Speech'), Ian Barnes ( Director, 'Wish 143'), Samantha Waite (Producer, 'Wish 143') and Gramma Funk (Grammy winner). 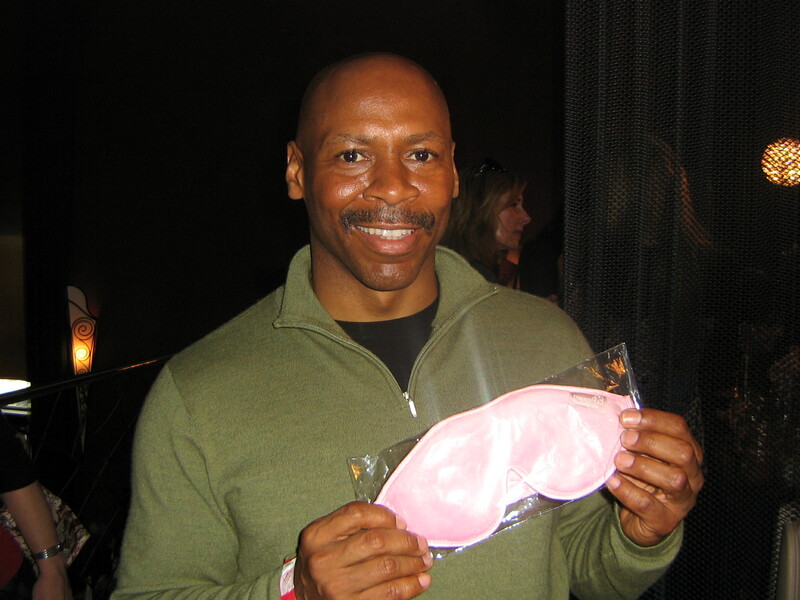 The pink 'Escape' sleep mask was designed, manufactured and donated especially for the event by Dream Essentials' owner, Mark Powell, who specializes in sleep solutions, with comfortable quality sleep masks that help people get the rest they need. All the celebrities received a mask of their own, perfect for night wear, cat naps and flights. Able to create new designs or tailor existing masks to fit customer needs at great prices, Dream Essentials' customers include hospitals, clinics, airlines, hotels and spas. The sleek 'nip & tuck' fashion jeans that the celebrities autographed were donated by Sally Allen Gerard, owner of London-based Wizard Jeans. With 4 colors, 3 cuts and a wide range of sizes, Wizard Jeans 'magically' enhance the silhouette, with 2 technologies that smooth and lift any shape - for men and women. Available in Indigo Blue, Stonewash Blue, Jet Black and Classic White, the back pockets of the Jet Black jeans are embedded with Swarovski crystals. They are soon to be available in the U.S.
Dream Essentials has also donated masks to Eva Longoria's 'Hollywood's 2010 Rally for Kids with Cancer' charity event and participated in several 'Dine in the Dark' events for the sight impaired, including 'Badger Association/Center for the Blind' and 'Visually Impaired Children.' Some of their clients include: Vancouver Olympic Village 2010, Dr. Mercola, 'The Sleep Doctor,' Meadows Sleep Center, Lucid Dream and several major hospitals. Wizard Jeans contribute regularly to the Macmillan Cancer Support charity. Jude Law autographed a pair of the Classic Whites, with his handprint on the back pockets, which will also be auctioned off on-line, starting on Valentine's Day on Wizard Jeans.com. Peter Mackeonis, a spokesperson for both contributors comments, "'Love Cures Cancer' is a wonderful charity, and I'm glad that both Dream Essentials and Wizard Jeans were able to help make the Valentine auction event, benefiting the Los Angeles Children's Hospital, a success."